Many collectors of what I’ve often though of as the “Spawn Generation” of the late 1990s will remember Moore Action Collectibles, one of McFarlane Toys’ few competitors at that time, whose products included detailed action figures of characters from Witchblade and The Darkness, as well as television shows like Buffy the Vampire Slayer. 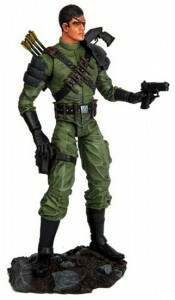 Moore kept something of a low profile in the action figure arena throughout the first decade of the twenty-first century, but now the company, now called the C.S. Moore Studio, is gearing to re-enter the market in the near future with some pretty neat toys. Mr. Moore was kind enough to answer a few questions for PoeGhostal.com. 1.) Many collectors remember the days of Moore Action Collectibles, especially the Buffy and Top Cow action figures it produced in the late 1990s and early 2000s, but it’s been nearly a decade since M.A.C. was actively producing action figures. What has brought the C.S. Moore Studio back to the action figure market? CSM: We had done the Alice and Calie statues with Zenescope and it had gone well. Over that time, Joe Brusha, co-owner and president of the company had asked me about sculpting action figures and after thinking it over for a few months, I decided to do a series with them. Their characters look great and have a look that goes well in any 3-D format. This is exactly why they say “Never say ‘Never again.’” I enjoyed working on them and collectors seem to like them. 2.) Many of the studio’s current product stems from properties created by Zenescope Entertainment. How did that relationship come about? I had met Joe at a show some years ago at a show and we got to talk a bit. I always thought they had a terrific look for their characters and they had and have a strong following, which is important in choosing projects. The public domain aspect was also interesting. After clearing some projects off my plate, we decided to do the Calie statue based on one of their covers by Billy Tucci, whom I had known a long time. I thought it was a great cover and would make a great statue. It sold out pretty quickly and we still get requests for both Calie and Alice. 3.) Some of your new action figure lines, particularly Jurassic Strike Force 5 and Monster Hunter’s Survival Guide, have significantly more articulation than has been previously seen on Moore-designed toy lines. What’s the impetus for the heavy articulation? These are toys specifically geared for kids, so playability was a big factor. Collectors toys are more about the look, but that being said, we’re going to add extra articulation to the Calie and Queen of Hearts action figures in the wrists and possibly the elbows. 4.) Will your upcoming action figure lines be available at brick and mortar stores or comic shops, or will they only be available through online retailers? They’ll definitely be available through brick and mortar stores. These are specialty market toys for collectors, so we’re offering through all of our sources, which includes as many brick and mortar stores as want them, so check with your retailer and let him know you are looking for them. 5.) What other projects or surprises does the CS Moore Studio have in store for toy fans? We always have new statues up for order, like the new Dawn Variant, which has Joe Linsner’s Dawn in her signature green colors. It really works well on her. It’s always great to work with Brian Pulido, so I’m happy to say we’re doing a brand new Lady Death statue that I’m going to try my best to have ready for debut at the San Diego Comic Con in July (booth 2800). It’s one of the best designs I’ve ever come up with and I think collectors will love it. Now some more big news is the announcement of our “Little Minxies” line, about which we’re hugely excited. These are curvy, gorgeous pin-up style renditions of characters like Aphrodite IX (Top Cow Ent. ), Sinful Suzi (Joe Linsner) and Kabuki (David Mack). We’ll also be doing characters from Zenescope, of course, and some of our own creations and designs, as well. Basically, we have plans for doing Minxies of all the great characters we’ve done over the years. I worked up the look for the Minxies with Manny Carrasco, one of the best artists I know, with a resume in video game character design, film animation and comics. He’s also a good friend and we had a blast coming up with this look for our new line. They’ll be produced in solid vinyl PVC and will be about 8” tall. We’re planning to keep them very affordable, so they’ll retail for $45-$60, depending on the cost of production of each character. You can see them and get more information on all of our products on our web site: www.csmoorestudio.com. Interesting review, Poe! Always cool to see what someone has been up to. Whenever I think of Clayburn Moore, I always think of the time in 1997 when Action Figure News and Toy Review featured the Witchblade statue on their cover. It was funny over the next month or two seeing all the mothers right in about how they couldn't give the magazine to their kids any more 'cuz it had a scantily clad lady on it! Very cool interview! 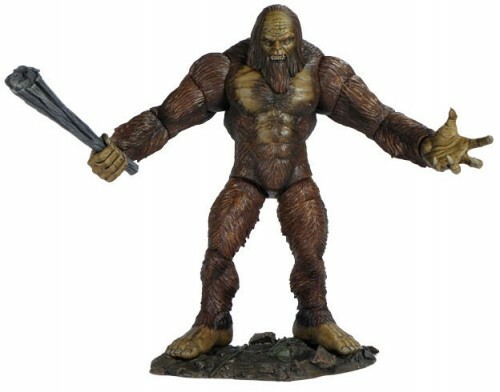 I'm quite excited that Moore is back in action figures and am really looking forward to "monster figures" like the Bigfoot and Dino's! I've always loved Moore's work. I have a number of his Top Cow figures. My Witchblade II, Bikini Witchblade, and Aphrodite IX statues are some of my favorite collectibles. I'm SUPER jealous of Poe for having the action figure base/statue that they came out with for their Lady Death figures, years ago. this was the interview i wanted to read, but it lacks the piece i was most hoping to learn… WHEN the JSF5 and MHSG figs were due… the initial solicit i believe was for last august. i'd love to know when i could actually buy those figs. The most interesting thing about the interview is that Moore thinks exactly opposite of Mattel and Hasbro: "articulation is for kids, limited POA is for adults" — instead of Mattel/Hasbro's usual reply of "these 5POA pieces of crap are for the KIDS, guys, for the KIDS — kids don't need artic." Anyway, they're both wrong. And I can't respect any company that doesn't understand that kids -and- adults like good articulation. The "articulation is for kids, limited POA is for adults" thing was the norm in the late 1990s and early 2000s, when Moore was competing with McFarlane. Most Movie Maniacs were pretty much statues, and Moore's Top Cow stuff followed suit. That changed when collectors really embraced Spider-man Classics and Marvel Legends, and it became clear there was a strong segment of the collectors' market that loved having lots of articulation. style is great, the articles is really nice : D.